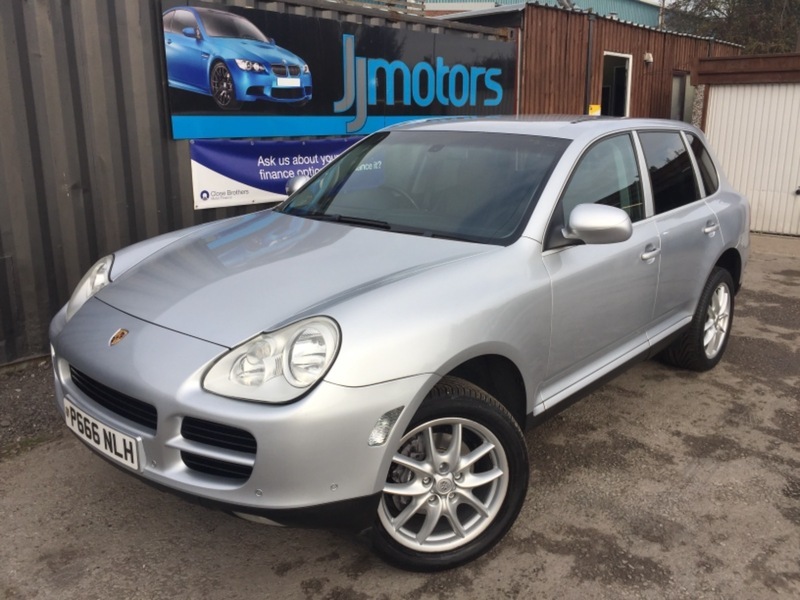 EXCEPTIONAL EXAMPLE PORSCHE CAYENNE, AN ABSOLUTE MUST SEE, STUNNING CAR INSIDE AND OUT BOASTING FULL SERVICE HISTORY LAST DONE APRIL 2018 AT 94K MILES, 11 SERVICE STAMPS IN THE BOOK 9 OF WHICH ARE PORSCHE MAIN DEALER! MOT UNTIL SEPT 2019, FULL LEATHER INTERIOR, HEATED FRONT SEATS, ELECTRIC ADJUSTABLE DRIVER AND PASSENGER SEATS WITH ELECTRIC LUMBAR SUPPORT, DAB RADIO, BLUETOOTH, PADDLE SHIFT, RETRACTABLE DOG GUARD, ISOFIX POINTS, SPLIT HATCH TAILGATE, CLIMATE CONTROL, 19" ALLOYS, ELECTRIC WINDOWS, ELECTRIC HEATED DOOR MIRRORS, FRONT AND REAR PARK ASSIST, FRONT FOG LIGHTS, SPACE SAVER SPARE WHEEL, REAR PRIVACY GLASS! Here at JJ Motors, customer satisfaction is our main priority as we endeavour to deliver and outstanding customer experience from start to finish tending to all needs and requirements. We pride ourselves in hand picking our selection of used vehicles to the best quality possible and undertake independent checks by our range of vehicle specialists to ensure our cars are prepared to the highest standard. Our prices are checked daily to ensure our cars are the best value on the market to compete with other dealers across the country! We offer a wide range of finance options through a variation of different lenders considering ALL cases to ensure the best package is provided for each individual customer. Contact us direct on 01773 741446 for the best deals! All our vehicles are HPI checked and are available with 12 months complimentary AA Breakdown cover. We welcome all vehicles in part exchange and offer competitive prices on direct purchase of a vehicle if you are simply just looking to sell! All our vehicles priced above £1495 come complete with 3 months warranty as standard with the option to extend up to 3 years. If you can't find what you're looking for on our website, please feel free to get in touch with us by phone, email or simply call in and see us on site as our stock changes on a daily basis so we may already have what you're after!